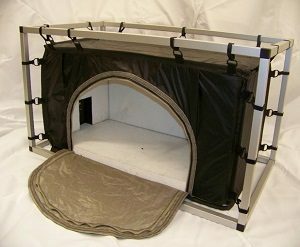 V Technical Textiles, Inc. (VTT) brand of RF & EMI shielding enclosures & tents are manufactured in the US. These flexible enclosures work based off the Faraday Cage principle of blocking Radio Frequency Interference. Our many valued customers use these enclosures for taking over the air measurements for product verification, performance, pre-certification, and quality assurance tests, along with production line measurements, and any application requiring an ambient free environment. Constructed with state of the art design, including ease of assembly, and minimal weight, allows the enclosure to be very portable. VTT’s design team gives its customers the ability to configured to suit to their own specific testing applications. VTT’s benchtop RF & EMI shielding enclosures & tents are self-contained, and professionally designed for wireless over the air measurements. Offered in the 8000T series: this three-layered construction offers an average of 95 dB of shielding performance from 30 MHz – 18 GHz. These Faraday Tents are constructed using the industry’s highest quality shielded material provided by Statex. The standard sizes manufactured measure, 2’ x 2’ x 2’ and 2’ x 4’ x 2’. Just like the larger enclosures this unit is available in multiple custom sizes, layers, and configurations. Our bottomless RF & EMI shielding enclosures & tents offer all attributes as the Portable RF & EMI Shielding Enclosures & Tents with the exception of the floor. The bottomless RF & EMI shielding enclosures are typically used for performance testing and In-Situ certification testing for automotive and aerospace applications. 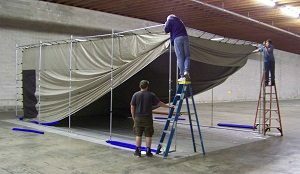 By dropping the bottomless Faraday Tent on a metal floor the Faraday Cage principle is still upheld. These enclosures can be constructed with an oversize utility door, a lifting mechanism, or a halo / truss ring system. Our portable RF & EMI shielding enclosures & tents are now available for rental or lease in floor and benchtop models. 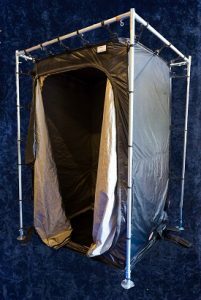 Our portable RF & EMI Shielding Enclosures & Faraday Tents are specifically designed to be used for product testing to EMI & EMC test standards, and they are now available to you for lease or rental. Whether you are performing pre-compliance testing or require In-Situ testing on the production floor, we have the solution that is right for your application.